Today's technology allows us to create email marketing campaigns that feature stunning images, animations and videos to help draw in audiences. But mastering the technology and learning industry best practices isn't easily done. Do know the correct text-to-image ratio to ensure your email campaigns are delivered? How email technology impacts the way a campaign renders in the inbox? It's okay if you don't know the answers to these questions... but your email marketing partner should! Not all email marketing companies bring the same expertise and experience to the table. Whether you want help with the launch of a program or year-round assistance, choose your email marketing company carefully. This ebook provides the key questions to ask each potential partner. 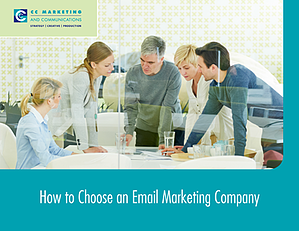 Download How to Choose an Email Marketing Company to ensure that your company's email marketing program will be in the right hands.